Food Blogga: Happy Halloween! Trick Or Butterscotch Pudding? Happy Halloween! Trick Or Butterscotch Pudding? Are you ready? Do you have your costume? Do you have enough candy to hand out to the little goblins in your neighborhood? Do you have whiskey? No, not for kids, for you. 6. Pour into 4 serving glasses or custard cups and chill thoroughly, at least four hours, before serving. 1. Before you begin to make the whipped cream, consider these helpful tips: Start with a deep stainless steel bowl that has been chilled in the freezer for about 15-20 minutes. Chill the beaters of the electric mixer as well. Both will help to create more volume in the cream. Once ready beat ½ cup heavy whipping cream on medium-high speed until soft peaks form. Sprinkle sugar evenly over the whipped cream and beat until peaks re-form. Whipped cream can be covered with Saran Wrap and refrigerated for 1-2 hours before serving. 2. 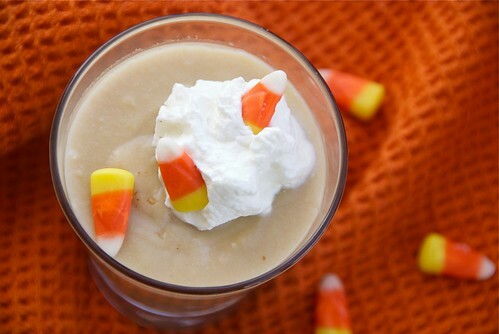 Top each pudding with a dollop of whipped cream and a few candy corns. Indulge. Mmm his butterscotch pudding sounds divine! A delightful pudding! Happy Halloween. I really love butterscotch pudding, and this sounds like a great one! Love the booziness. Ooh, yum! Wish I had some scotch or whiskey in the house right now. But it's Sunday, and the liquor stores are closed. :( I have a hunch that the cognac I have would taste pretty good, however! That looks delicious! I think I'll be making that relatively soon. Haha I think the whiskey will be necessary to stop the ringing in my ears that will become permanent once the doorbell is used so much. This pudding looks fantastic! Love the butterscotch pudding. Happy Halloween to you too. I share David Lebowitz's love of actual scotch in butterscotch. Just made this pudding with 12 year old Glenfiddich and it's delicious. However it's too sweet for my taste, but it will probably be alright when cold (I'm eating it warm from the pan). rosa-Same to you, my dear! tastyeats-Ooh, brandy would be lovely too. Let me know how it tastes if you try it. beth-I hope it's really soon, for your sake! joanne-Ha! It'll be the trick! sam-Hope your night was filled with treats! dextery-It is less sweet once it's chilled. I'm so happy you made it. I hope you ended up enjoying it.